The next Loose Muse will be on Monday 8th April at the Discovery Centre, 7.30pm – 9.30pm, £6 on the door. It will be a Special Open Mic as I will be away at Kim Moore’s Poetry Residential in St. Ives. Louise Taylor will be my guest host and men will be able to read this time, so please bring along your poems, short stories and flash fiction to share as there will be plenty of time to hear more than the usual one from each! I am registering our ‘Loose Muse Poetry Performance’ for Heritage Open Days and hope to acquire St. Lawrence in the Square for this like last time. I will keep you informed about this and in the meantime poet, Hilary Hares has kindly offered to run a Poetry Workshop to help kickstart inspiration on the theme of ‘Writing Poems on Food and Drink’ which is the Winchester theme for Heritage Open Days alongside the National theme of ‘People Power’. The Poetry Workshop will be on Sunday May 12th, 11.15am – 1.30pm in the Tower room at the Discovery Centre. The price is £18 and a deposit of £5 payable at April’s Loose Muse is requested this time. This is because people have put their name down for workshops in the past but then not turned up on the day. This is disappointing especially as the last few workshops have sold out and so it prevented others from joining us. These workshops are fundraisers for Loose Muse and help to cover the costs of booking the best poets so please come along if you can. Hilary will be making a list of names and taking your deposits at Monday’s Loose Muse. There is, of course, no need to go to the workshop in order to send me your poems to be chosen for our performance. The only qualification is that you must have read your work at one of the Loose Muse Open Mic sessions. I look forward to receiving your poems and expect great things – like last time! Winchester Poetry Festival are undertaking market research and have asked me to involve Loose Muse as we are important to the local poetry scene. This means that at April’s Loose Muse there will be a researcher who will talk for a few minutes to tell you their plans, hand out questionnaires and ask for your help. There will be a follow up to this in May at Loose Muse when I’m back. Looking forward to seeing you again in May. Expect an explosion of activity nationwide, thousands of amazing events across the UK – in schools, libraries, bookshops and hospitals, on buses, trains and boats – all celebrating poetry’s power to bring people together. Just look at our events listing to see what’s happening near you. Andover Radio’s Poet Laureate Daniel Hooks (“The Alien Poet”) is asking budding poets from around Andover to take part. “I would love to hear from people who want to get their poems broadcast. “Poets will be given the chance to submit poems for broadcast on Andover Radio. Poems should ideally be 40 seconds long when reading out loud and they must have the theme of ‘Change’. Poets are welcome to come to the Andover Radio studios on Andover High Street to record their works. We are pleased to announce that the following poems have been selected by our judge Liz Berry as the longlist for the 2018 Winchester Poetry Prize. 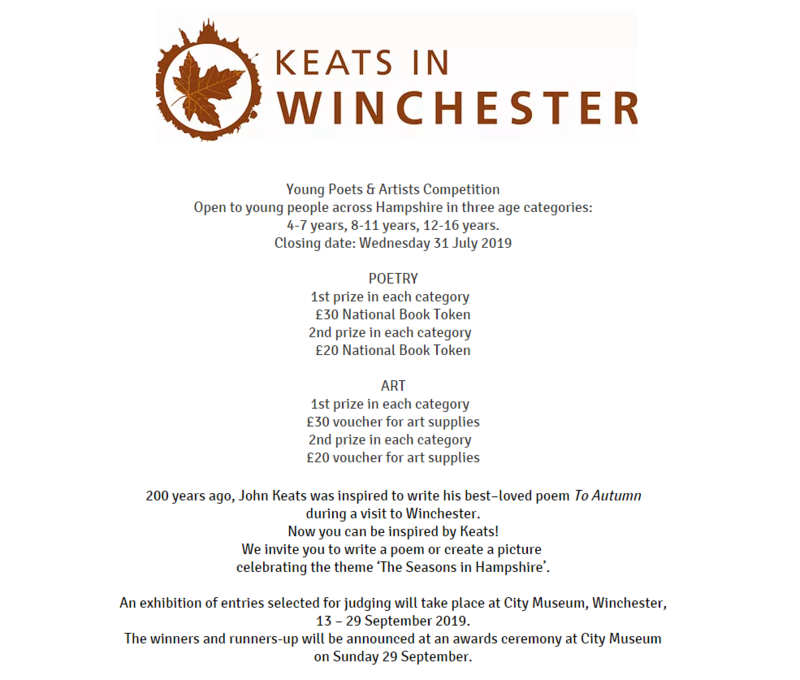 The winners will be announced at a special prize-giving event at the Winchester Poetry Festival on Saturday 6 October 2018. Tickets for this event are free and can be booked via the Theatre Royal Winchester Box Office. Winning and commended poems will also be published in a competition anthology to be launched on the day. Thank you to everyone who entered their work, and for supporting the Winchester Poetry Prize 2018. Poetika are calling for poetry submissions for 2 different poetry festivals. Salisbury Fringe Festival and Salisbury Literary Festival are both calling for poetry submissions. Salisbury Fringe – the established festival of cutting-edge drama by local writers performed in a variety of informal venues during the first weekend in October. Poetika’s mission at the Fringe is to bring poetry to the drama. Poetika are seeking works of ‘dramatic poetry’ for the event, where they will be performed by professional actors. Submissions close on Saturday 30th September. 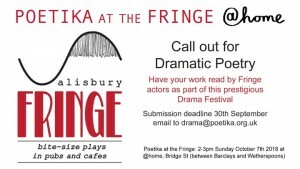 E to email your pieces (5 mins max) to drama@poetika.org.uk . New this year- The Salisbury Literary Festival is taking place over the last weekend of October it will be a feast of readings, talks and workshops, celebrating the best in literature by writers with a local connection and some from further afield. Poetika has an event – City of Poems – as part of the festival, where in addition to presenting some of the best known poems written about the city, Poetika will be reading a selection of works specially written for the Festival by local people. Send Poetika Salisbury poems (max 5 mins) to be read at the event. 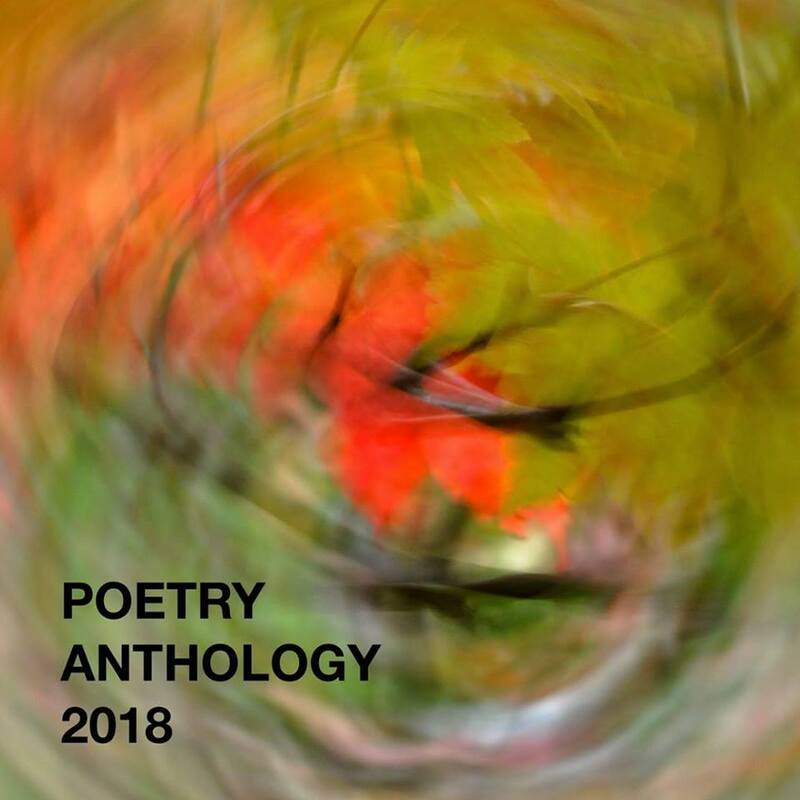 Poetika is also creating a pamphlet of chosen poetry which will be on sale at the event and at other venues in town (all sale proceeds going to Poetika’s adopted charity, Childrens Chance). You have until midnight on Saturday 30th September to email your pieces (5 mins max) to city@poetika.org.uk. 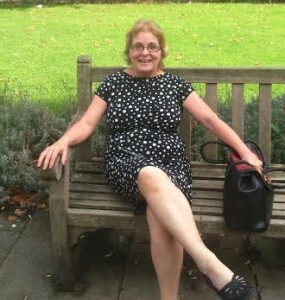 Bobbie was working in Tidworth Library as a library assistant when she was diagnosed with Parkinson’s in 2002. Parkinson’s disease is progressive neurological condition. People with Parkinson’s don’t have enough dopamine because some nerve cells in their brain have died. The chemical dopamine is produced naturally in the body and functions as a neurotransmitter. It is part of the pleasure and reward pathway of the brain and is involved in memory and motor control. Symptoms of Parkinson’s include depression, shaking, moving slowly and stiffness. Bobbies first reaction to her diagnosis was a private prayer of “God don’t make me bitter,” She decided to become a good finder. Bobbie is adamant poetry has helped her retain a sense of who she is and it has not let the Parkinson diagnosis eat her away. At a difficult time where a lot of people would be afraid to go out in public Bobbie became a staunch crusader for people suffering from Parkinson’s. She has written two poetry books “Finding the light” and “Reflecting the light” to raise money to fight the disease. Bobbie’s poetry crusade started in 2003, when an intuitive friend said ‘I’ve a vision of you as a poet.’ Bobbie went home, wrote a poem and just left it on the computer. But after writing her second poem ‘Freak’ she realised life had changed. Bobbie’s poetry is accessible, connecting with her audience at a visceral level. She is very good at capturing emotionally charged moments in time. Her poetry is easy to understanding, using rhyming schemes that her fans enjoy. Bobbie’s audience can read her poems and immediately connect with the subject or character she is writing about. Bobbie has been through a major change and acknowledges she’s gained as well as had things taken away. Andover and Hampshire audiences enjoy her poetry. She is a regular speaker at WI groups. 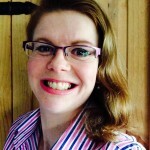 You can find her books in many varied places around Andover as diverse as Beaker Button wool shop in Weyhill Fair to the Vine Trust Christian bookshop in central Andover as well as Amazon. Bobbie has been a consistent supporter of the Andover Poetry competitions when it ran from 2011 to 2014. In the first competition she placed second overall and in the last she was 1st in the Andover section. You can still buy her 2011 winning poem as a post card on the Travelling Bookstall. Bobbie will be performing at Andover Poetry Cafe on February 14th at the Rendezvous Cafe, 8 Union St, Andover SP10 1PA. The cafe starts at 1.30pm. She will also be performing at Books and Words at The Lights Andover on February 14th between 12 and 12.30 pm. Take one Puck and griddle the Earth, mid-simmer, for forty minutes, with acorns to taste. Sieve a freshly blooded Montague and a young Capulet into the mix, checking expiry dates. Dust nightly with a spot of Lady M. to garnish, or cheat by using leaves from Dunsinane. How a rich and full-bodied Malmsey will accompany this nicely – but don’t serve with Scotch! I ‘love’ words! I get great satisfaction from arranging and rearranging them to form exquisite poetry (in my opinion) and the performance of many of these poems has brought me (and others?) a great deal of pleasure. 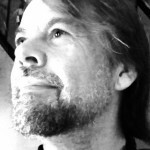 I also ‘love’ Shakespeare – and any chance I get I purloin a phrase from the Bard to improve my works tremendously – He has said nothing on this – therefore I assume he approves. I studied music and composition before I came to work at The Lights. Bobbie Coelho was born in Norwich and has been writing poetry for many years. She has produced 2 anthologies of poetry. Finding the Light in 2010 and more recently Reflecting the Light. She is married to Steve and has two stepson’s and 3 grandchildren. Reflecting the Light is available on the Travelling Bookstall.